When you click on an infobox, use a quicklink or select a category on a generated map the zoom level will change (if you have enabled it in your excel parameters.). Here I selected a single marker, and it zoomed in to the level I specified in the 'zoomlevelonselect' parameter in my geocoding parameter sheet. Clicking on the marker again will restore to its regular size. In this case, it will resize according to bounding box rules, if enabled by the "resizeboundingbox" parameter. This means that it will zoom to the maximum it can but still show all selected items. For Example, here I select the category "united states". 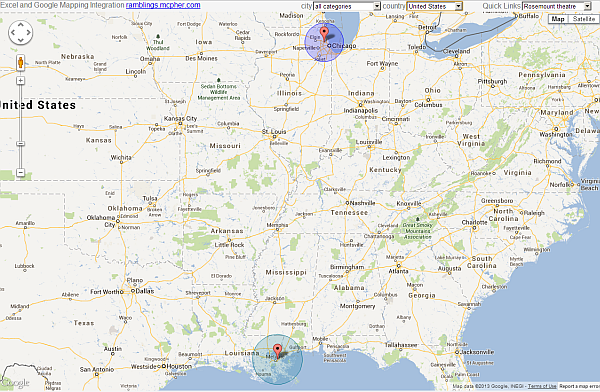 and it resizes to show the two places in US. To reset, just select all categories. 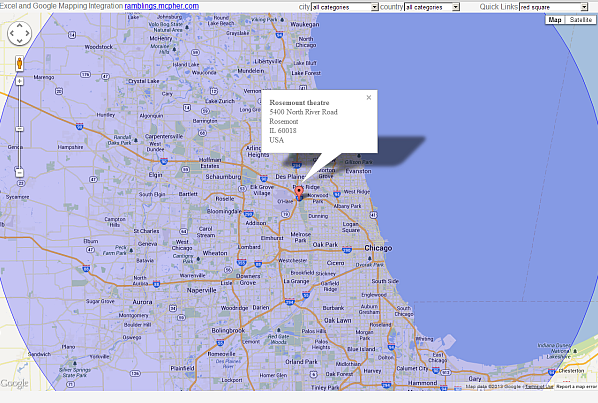 See here for more about Integrating Excel with Maps and Earth.